Whatever your schedule or budget, there are many ways you can do something to make someone else’s Christmas a brighter one. 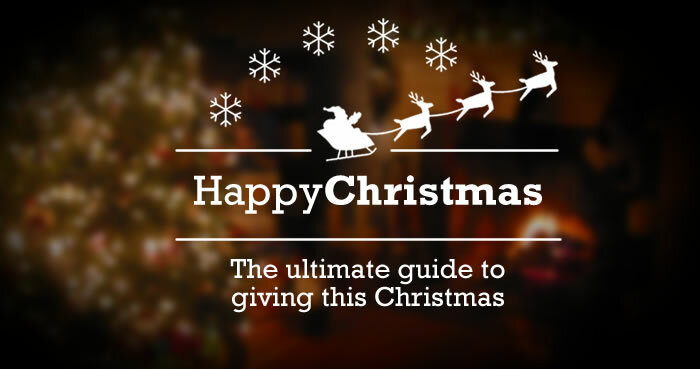 From simply buying your Christmas gifts online from one of many online retailers who give something back for each purchase, or buying a hot drink or meal for someone who has fallen on hard times, to giving up your Christmas dinner to volunteer at a shelter. Changing your views on giving at Christmas time can be a rewarding and humbling experience. We have compiled a comprehensive list of ideas for anyone interested in making a difference this festive season. If you have any comments or suggestions for this list, please contact us via Twitter or our Facebook page. One of the easiest ways to do something good at any time of year, but especially at Christmas time is to donate to a charitable cause. The links below will allow you to donate money online quickly and easily. ShareTheMeal is an initiative of the United Nations World Food Programme WFP is the world’s largest humanitarian agency fighting hunger. With a tap on your smartphone you can “share the meal” with a child in need. It costs only US $ 0.50 to feed one child for a day. If you have a little more time, giving a gift may be a more rewarding and personal way of giving at Christmas, especially if you have children of your own. Taking your own child shopping for a gift for another child who is less fortunate than themselves can be a rewarding experience and can help show them that giving is just as important as receiving at Christmas. Children’s homes and hospitals often accept presents for children in their care. We have collected a list of places where you might like to send gifts too. Most places can only accept new items. As the children in their care might have specific health conditions they need to be extra careful with what gifts they pass on. Before you send any gifts, check the guidelines offered by the recipient organisation. If you’re in doubt just call and ask what gifts would be good this year. If you have unused toys at home then donating them to charity shops or selling them yourself and donating the money is most suitable. See further down for all the places you can donate second hand toys and gifts too. Some of the suggestions for donations here involve you delivering your gift, others will let you purchase a gift online and have it delivered on your behalf. Being homeless at any time of year is a terrible situation to find yourself in but Christmas time is an especially difficult time to be on the streets. As the cold weather draws in, decorations go up and Christmas parties are in full swing, why not try to show a little love to someone living on the streets this Christmas? Organisation who help the homeless can make use of your monetary donations, time, skills and food. Not everyone has spare cash at this time of year. Christmas can be a huge financial burden on many families. An easy way to help out is by recycling used or unwanted items and it doesn’t cost anything. Donating unused items puts them to far better use than letting them collect dust or throwing them away. Below are some organisations that will put your unwanted items to good use. Making a difference doesn’t need to involve giving gifts or money. One of the most rewarding things you can do is getting involved with an organisation or event by donating your time. There are plenty of organisations that need your help over the festive period all over the UK. See how you can get involved. St Mungo’s Broadway provide a bed and support to more than 2,500 people a night who are either homeless or at risk, and work to prevent homelessness, helping about 25,000 people a year. Older people are often overlooked at Christmas but they are some of the most vulnerable. Age UK provide support for older people throughout the year. No one should be alone at Christmas. Friends of the Elderly is calling on everyone to Be a Friend and help change the future of loneliness. The Salvation Army run a network of over 1000 drop in centres over the Christmas period which provide food, shelter or just someone to talk to. They are looking for donations of either money or time to support their work. Beanstalk recruit and support Beanstalk trained reading helpers to provide one-to-one literacy support to children who have fallen behind with their reading. Most people will be buying cards and gifts this Christmas. There are numerous websites and charities that support good causes when you buy online. This is one idea that almost anyone can get involved with. Oxfam shops offer a huge selection of gifts and cards. They’re also a treasure trove for Christmas party outfits. Making a difference doesn’t necessarily mean spending a lot on gifts or charity bike rides. Often a simple gesture will make a huge impact on a person’s day. An unwanted winter coat or blanket (good condition and washed) is a welcome gift for someone living rough. Package some basic essentials in a ziplock bag or unwanted toiletries bag. Toothpaste, soap, baby wipes, cereal bars, clean socks, bottled water etc are all good things to put into a homeless pack which can be stored in a work bag or car boot and given out when you need it. Free hotel toiletries are also a great free way to make up gift parcels. A few minutes of your time costs nothing. Rather than looking the other way, stop and have a conversation, share a cigarette or anything that makes a person feel more human for a few minutes is great way to show you care. Utilise the power of social media and challenge your friends to do one good thing over Christmas on Facebook.